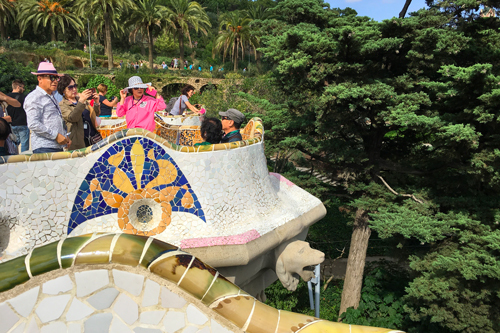 For lovers of shiny, bright colours and the sinuous lines of modernist art, a visit to the extravagant Park Güell is an absolute must. One of the most beautiful and at the same time, one of the most classic sites in Barcelona, which no visitor should miss out on seeing. Entry passes to the park provide visitors with access to the entire, vast area, with the only exception being access to the Gaudí House Museum which can be visited with a separate entry ticket. In this article, you will be able to see in detail, what is involved in a visit to the park and why deciding to buy your tickets on-line is more convenient. What can I visit inside Park Güell? There are three different accesses, but, bearing in mind that the main entrance is in Carrer d'Olot: the first thing to enchant visitors are the two delightful small houses, one on the right and one on the left of the entrance gates which were originally designed as homes for the gate keeper and his family. Both have beautifully coloured roofs which were built with the traditional Catalan tiles and decorated with the same technique which is used for mosaics. Their appearance is somewhat reminiscent of the marzipan houses of fables, such as that in Hansel and Gretel. As soon as you pass through the cast iron gates, which also bear the hallmark of Gaudí's genius using the modernist style, you will be enchanted by the stunning staircase ahead of you and the distant view of the columns in the Hypostyle Hall. The Dragon Staircase which is sub-divided into three sections, finishes, (or begins, depending on your perspective), with the famous dragon or lizard which has become emblematic of the Park and of Barcelona itself. Trying to describe in words the beauty of this park of a thousand colours isn't easy, but it's enough to know that the beauty of the colours, the elegant and sinuous forms in this park, manage to surprise and enchant hundreds of tourists every day. Paying a visit here on a beautiful sunny day will make the experience even more enjoyable because the brilliant colours in the mosaics become even more beautiful and more eye-catching. Visit the Greek Theatre with its large capitals which has been sculpted in the form of a palm tree, the Laundry Room Portico with its majestic sloping columns and the Austria Gardens. In addition to all this, you can stroll along the pathways, surrounded by the lush vegetation of the park and breathe in the natural beauties of this oasis of greenery. Another feature of the park which shouldn't be overlooked, is the stunning views it provides across the Catalan capital from on high which is even more special when viewed at night. In order to avoid the long queues, it is strongly recommended that you buy your entry tickets on-line. On the day of your visit: Show the tickets on your smartphone and remember to be punctual as they are quite strict at Park Güell with the timings due to the number of visitors. The last access is one hour prior to the Park's closing time. For further useful information, visit our web page: Park Güell. You can read the fascinating history of the park, find out the easiest ways to get there and many more details. If you want to make your visit to the park even more special, visit the web page: English speaking Guide in Barcelona. A guide who speaks your language will accompany you on a voyage of discovery around this wonderful masterpiece of modernist architecture making it more fun as you quickly discover all the vital information that you would never have discovered on your own!